Shop till you drop Shopping is something of an obsession in Glasgow and for good reason: the city has spawned world class designers such as Jonathon Saunders (who can count Kylie, Madonna and Thandie Newton as fans). Sauchiehall Street and Great Western Road are lined with boutiques competing for your cash, while the lanes around Byres Road are packed with shops selling secondhand books and antiques. If you’d rather your shopping experience came with an elevator and air conditioning, make for malls such as Princes Square and the Italian Centre. Quaff cocktails Forget castles. Glasgow is all about cocktails (and world class cuisine) and consequently is teeming with trendy bars, hotels and restaurants. Aim to start or end your evening over a cocktail (or three) in one of Bath Street’s star bars. Alternatively make for Merchant Street (home to Glasgow’s greatest concentration of pubs and clubs) or the exclusive Conran-designed Zinc in Princes Square. For fine dining, look to the long established Buttery or the Dining Room. Cruise the Clyde Taking a cruise down the world famous Clyde River – arguably the heart and soul of the city (it is often said that “the Clyde made Glasgow and Glasgow made the Clyde”) – is a great way to get to grips with Glasgow. 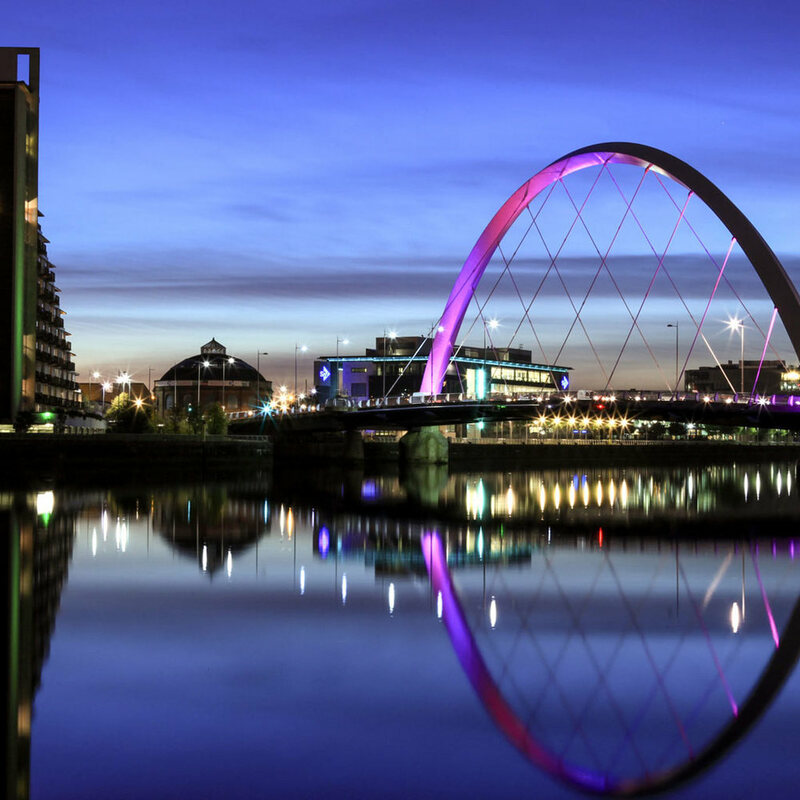 The river tells the story of Glasgow’s industrial past and beyond: expect to pass landmark sights such as Finnieston Crane, Bells Bridge, the Financial Services District and Glasgow Harbour – a 120 acre development of former dock and shipyard land that is one of the largest waterfront regeneration projects in the UK. Tours depart during the day but if you can, try and take an evening cruise: the bridges, buildings and trees that line the river banks are beautifully illuminated at night courtesy of Glasgow City Council’s lighting art projects. Check out Charles Rennie Mackintosh Creative genius, Charles Rennie Mackintosh (1868 – 1928), was born in Glasgow and as such the city houses the pre-eminent collection of his buildings, drawings and designs featuring leitmotifs like the Glasgow rose. Mackintosh made his mark on three types of architecture – public buildings, private houses and tea-rooms and happily the majority of these still exist today. Fall for football Glasgow is a football mad city with ‘who do you support?’ replacing ‘Hello, how are you?’ as a standard form of introduction in polite society. The focus for this football obsessed city is divided into Rangers’ Ibrox Stadium in the south, and Celtic Park in the north-east but neutral football enthusiasts will want to check out the Scottish Football Museum. Located at Hampden Park, Scotland’s national stadium of football, the museum is houses memorabilia, video clips and displays covering almost every aspect of the beautiful game and the importance it plays in Scotland. The people Glasgow’s tourism tag line reads: People Make Glasgow. The new slogan says it all: Glaswegians are famed for their openness and friendliness, community spirit, selflessness and gritty can-do spirit. Or as Ian Mitchell - the historian and Aberdeen born author of A Glasgow Mosaic - puts it: "As an outsider to Glasgow, I think there is a definite Glasgow character. A definite Glasgow sort of collectivist social identity and solidarity."